← PrestaShop 1.6 Exclusive Preview: New Back Office! There are two ways to installing DNN. One is through the app gallery (which may not be available where you host) and another way is doing a manual install. Here are the instructions on how to install the latest version of DNN manually. 2) Go to https://dotnetnuke.codeplex.com/releases/view/112531 and download the latest version from there. The “New Install version” would be the one you’re looking for, so download that. In this case, we’re going to use Filezilla, since the Websitepanel only allows 10MB max for uploading files. It might be different due to the version you are trying to install. 7) You can now proceed to enter the database info from what you just created via the websitepanel and let the automatic installer do its thing. 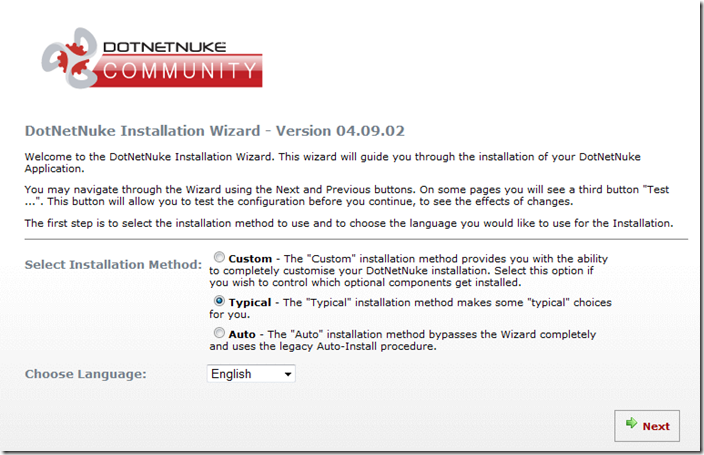 Congratulations, you have just installed a working copy of DotNetNuke!